I can see the numbers in all the circles, save circle 5. I swear, I wore those assless chaps only once! Actually, this test has nothing to do with Russian Army. The first blog entry where I saw it (not the English-Russia one where you link) says that the test is used in the US Army. Other people who reposted it (I think I have seen it at least 10 times over the last 2 days) referred to some “foreign” or “Western” army. It is easy to see (for me, at least) that the original descriptions of tests were in English. Sounds like a major hoax to me. I could buy the Russian Army being so dumb as not to make the difference between a color-blindness test and a psychological assessment test (barely)… but I highly doubt nobody there would have realised by now that one of their “test” was just a baseline check that most people aren’t expected to read properly (my love of brunch with mimosas notwithstanding, I’m pretty sure my inability to read #5 makes me any more of a dangerous sexual deviant than it does you). @Dave I feel I must point out that gay =/= “dangerous sexual deviant”. Haha you guys really can’t read number 5? Turn of your George Micheal record, and look for the number 6. Definitely a hoax. This is a standard colour-blindness test done on pilots to ensure that they can distinguish between red and green lights (which are on different sides of the plane, so useful for telling if those lights are coming towards you or moving away). I think it’s fake as well, but watching people squint really hard at circle 5 in a desperate attempt to see the number is quite amusing! Is it bad if I see CATS from “Zero Wing” in image #5? I can’t see number 5 either. I’m so relieved that I’m not the only one! I can’t see 3, 5 and 6! I’m teh debaucht schizophrenik ghey! And red green colour blind. Once I was hanging with Quin Martin on a patio and Kyree Vibrant came by wearing shorts that looked just like those tests. She accused us both of perving on her, but we were just looking for the numbers. I opened it up in Gimp and did Colors->Hue/Saturation then rotated the image through the entire Hue range. Nothing showed up in Circle 5 except noise. hahaha.. yeah theres number 3..
You idiots it is a hoax. I remembered seeing the same picture already and being able to read all the numbers. 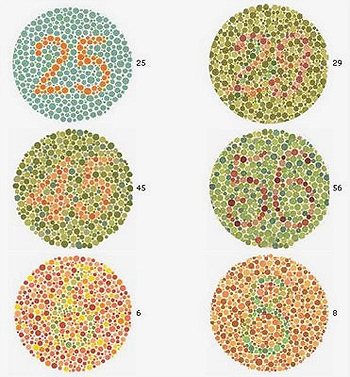 we call this ishihara test and use it for testing color blindless. Previous post: CollegeHumor Reviews Star Trek. Or Was That Star Wars?